From the fireplace to the stove, from the barbecue to the oven, cast iron is the ideal conductor of heat. Find out how to clean cast iron with our tips! Cast iron is a ferrous alloy with high carbon content. Compared to mild steel – where the carbon content is lower – cast iron is harder and more resistant to abrasion and rust, but at the same time less resistant to impacts. Despite this, cast iron also has many advantages, including resistance to high temperatures; being an excellent heat conductor – which holds and then gradually releases heat – it is the preferred material for the construction of chimneys, stoves and radiators, barbecues, grills, and hobs. If you want to know how to clean cast iron, follow our suggestions; although cast iron is very resistant, keep in mind that since it has a porous surface, you need to take some precautions to avoid damaging it in depth. Cast iron cookware is not procrastinators’ best friend. You should clean it right after cooking, and you can’t leave it in the sink soaked in water for days. Sorry to inform you of that, but that’s what you should avoid doing to not end up with a rusty cast iron pan. What you can do, instead, is to wash the cast iron pan by hand using hot water and a sponge or stiff brush while it’s still hot or warm. Remember to use tongs or wear gloves if either the pan or the water are still extremely hot. Keep your pan away from the dishwasher, soap, or steel wool; they will damage its seasoning and consequently impact its unstickiness. If you want to remove stuck-on food, you can scrub the cast iron pan with a paste made of coarse kosher salt and water and then rinse or wipe it with a paper towel. Boiling water in the pan is a great idea to loosen and easily remove stubborn food residue. Like all metals, cast iron also oxidizes in contact with oxygen in the air. The rust that is created on its surface due to oxidation alters its resistance; therefore you should remove it as soon as possible. If on your cast iron object – be it a pan, a grill or the round plate of a stove – there are only a few rust spots, then the job is simple. Put a little baking soda directly on the part to be treated and add a few drops of vinegar, leave for at least an hour and then remove the rust with a spatula. Alternatively, leave the object submerged overnight in a solution of warm water and baking soda: the morning after removing the rust will not be a great effort. Here is how to clean the cast iron from rust without resorting to abrasive tools! 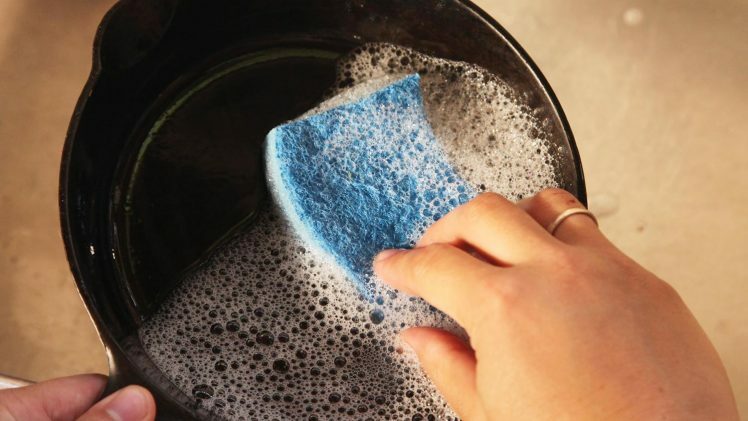 After washing or treating with vinegar and baking soda of any cast iron kitchen utensil, you should always pass a sheet of absorbent paper greased with olive oil over its surface: it will protect the cast iron pan from future damages. If the rust has already abundantly corroded the cast iron, then you will have to use an abrasive cloth to remove it. In this case, after vigorously rubbing the part, you will also have to re-season your cast iron cookware, but that’s another story. 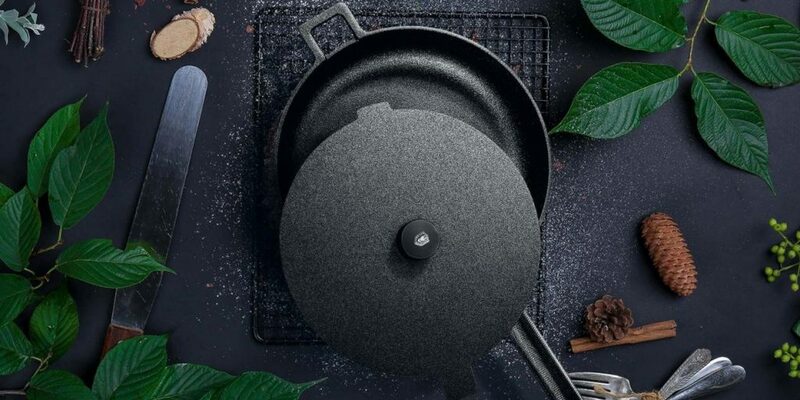 If you’re new to cast iron cooking, here’s where we are glad to introduce you to pre-seasoned cast iron cookware. 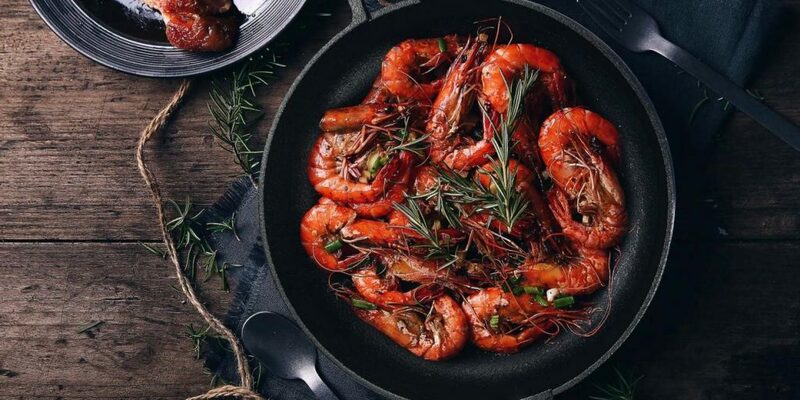 Pre-seasoned means that a coating of vegetable oil or animal fat has been applied to prevent the cast iron cookware from rusting while it sits on store shelves or in your kitchen cabinets. This type of cookware is ready to be used straight out of the box. However, once the food starts to stick, you’ll need to season it again. When you buy a pre-seasoned cast iron pan, casserole, or wok, you will have plenty of time to learn how to season them by the time their seasoning will have started to fade away. In particular, we highly recommend Velosan’s cast iron cookware, which comes pre-seasoned with a natural layer of fat. This natural fat layer not only gives a unique aroma when cooking but also forms a natural protective film over time. 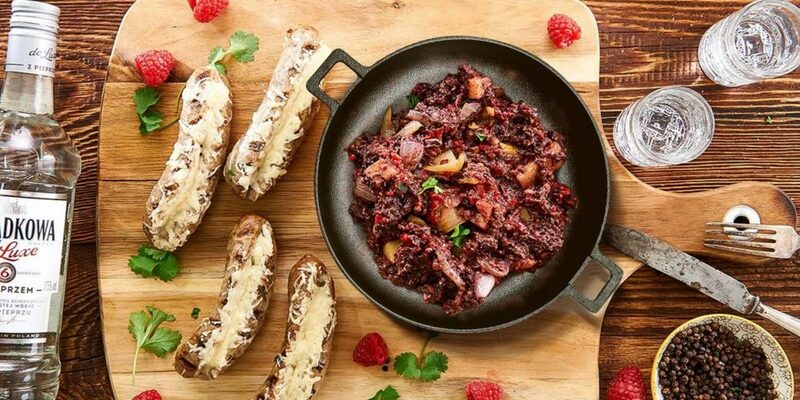 That’s one of the reasons why Velosan is one of the most beloved cast iron cookware brands both by professional chefs and fledgling cooks.